At a politically charged Dec. 30 special meeting of the Grover Beach City Council, seemingly everyone in attendance was flabbergasted. 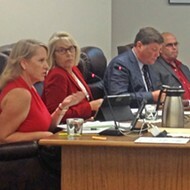 Supporters of Mayor Debbie Peterson were flabbergasted that she’d been removed from her seat on the county’s Air Pollution Control District (APCD) board earlier in the month. Peterson’s fellow council members were flabbergasted at her behavior and insistence on a meeting for what they deemed a non-issue. Peterson herself professed to be flabbergasted that the meeting’s public comment period centered on reappointing her to the APCD. “I had no idea that this meeting would be about putting me back on the APCD,” Peterson said, to scattered laughter. She then asked the audience not to laugh. Peterson called the special meeting to “discuss the recent communication received from the Friends of Oceano Dunes.” The Friends are an off-highway vehicle (OHV) advocacy group. That “communication” was a Dec. 18 letter from Friends president Jim Suty that expressed concerns about Peterson’s removal, asked the council to reappoint her, and hinted at Friends’ intent to appeal the city’s long-awaited Lodge and Conference Center project if Peterson wasn’t reappointed. The council chambers were packed, many of the 60 to 70 attendees were holding “Vote Debbie Back On APCD” signs or sporting blue Friends jackets. 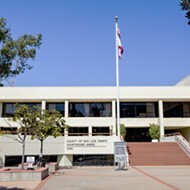 Of the 25 speakers, 21 were in favor of reappointing Peterson, and four stood by the council’s decision to replace her. “My goal tonight was to see if we could find common ground with Friends, and I don’t think we did. It’s important to listen to their concerns. I certainly don’t want to see the lodge project stalled, but it’s up to you guys now,” Peterson said, gesturing toward the dais. 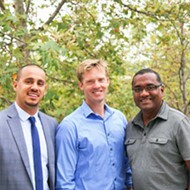 Peterson’s three fellow council members—Glenn Marshall, Jeff Lee, and Bill Nicolls—were visibly exasperated by Peterson’s demands to further appease the Friends, and agreed only to draft another letter reiterating their support for recreation on the dunes, which they said has never wavered. The council didn’t take any action regarding the APCD seat. 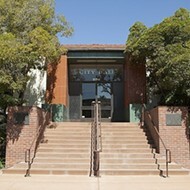 Council member Karen Bright, who replaced Peterson as the Grover Beach representative on the APCD, was absent due to illness.